A tea pot, modestly positioned in the hearth below. Hyouge Mono is a work that emphasizes subtlety. This may be a surprising statement as many early reviews remarked upon things like the extreme facial expressions of the main character, Sasuke Furuta. What has become clear as the series progressed (and at episodes 7 & 8, we are still not one third of the way to the end) is that Sasuke, though the main character, in terms of much of our perspective on the period, and in terms of providing a center around which the events of the story swirl, is by no means the most astute character. These two episodes provide a clear indication that, though he has an eye for detail, Sasuke does not (at least yet) possess the discernment of human nature to interpret these details correctly. Master Senno. More than a tea master, he has an eye that pierces into the soul. Episodes 7 & 8 fit together nicely as they both relate three intertwined narratives. The first of these is the germination of the seeds of rebellion. In particular we see General Mitsuhide Akechi denied lands that he long had fought to acquire. In a visit by Senno and Sasuke to take tea with Akechi, Sasuke enjoys the visibly displayed treasures that Lord Nobunaga Oda has bestowed upon Akechi and declares that he must love Lord Oda very much. Senno does not correct him, but mentally notes that it is the very obvious display of the famous Hakkaku tea kettle that indicates that Akechi is dis-pleased with Lord Oda. 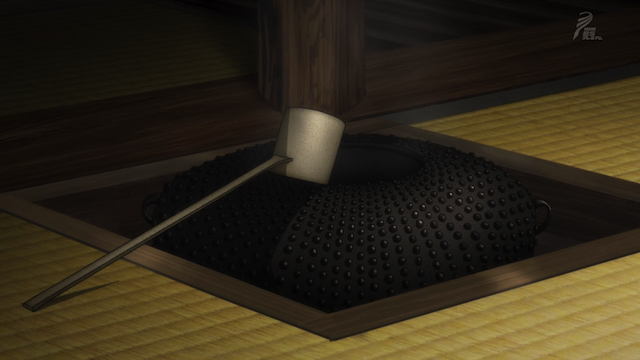 The kettle is intended to be positioned into a hearth built into the floor (as can be seen in the image of Master Senno’s own tea kettle in the screen shot at the top of this post). By so obviously showing his reverence for Lord Oda, General Akechi has fooled Sasuke, but revealed his displeasure to penetrating gaze of Master Senno. General Hideyoshi floods Takamatsu Castle, but a deeper plot is also afoot. 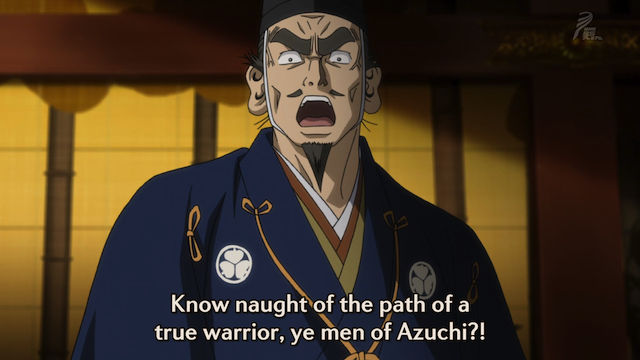 Hideyoshi, Akechi, and some of the other generals are getting restless about their chances for upward mobility, given that Lord Oda seems intent on becoming an emperor, and granting all of the territory claimed for him by his generals, not to those who took the lands, but to his own kin. The slow flooding of Takamatsu Castle during the rainy season is an excellent tactic that plays out over the course of the two episodes. In the meantime Hideyoshi is hoping that Akechi will rebel against Oda. 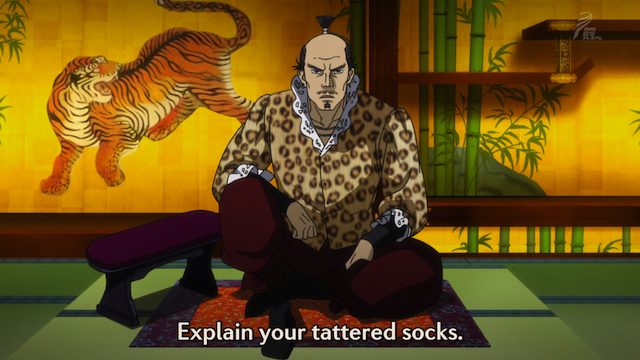 Lord Nobunaga Oda doesn't approve of socks with holes in them. 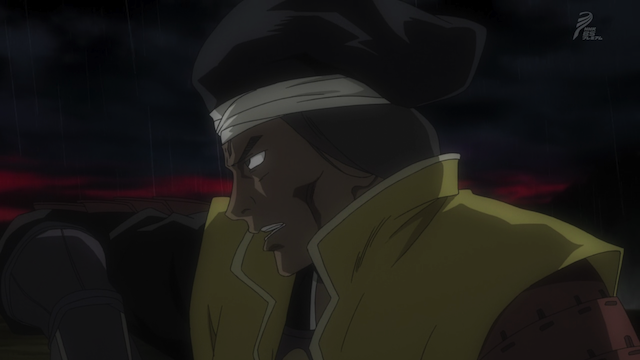 The third major thread that intertwines the two episodes is the banquet that Lord Oda provides for Ieyasu Tokugawa. 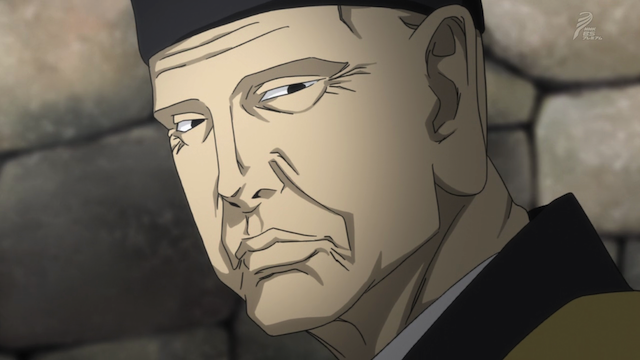 Akechi is to oversee it, and he requests the cooperation of Master Senno (who, as a merchant, is in control of an import house), and Senno involves Sasuke. A historical point, for those who don’t know. Nobunaga Oda is the major force behind the unification of Japan. He was effectively succeeded by Toyotomi Hideyoshi (seen in a screenshot above). Hideyoshi was succeeded by Ieyasu Tokugawa (shown in a screenshot below), who became the founder of the Tokugawa shogunate that lasted until the Meiji restoration. The period that is covered in these episodes is a remarkable one that precedes some of the most significant events in Japanese history. So the first thing to comment on here is the contrast between Nobunaga Oda, the aesthete, and Ieyasu Tokugawa, the warrior. Tokugawa shows up with a hole in his sock, and Oda says that lords should look fine to give the people something to look up to. Tokugawa contradicts him, saying, “we expend naught for luxury, as our lands are nurtured by the blood of our people”. Tis a barbed fruit of Luzon, hollowed and filled with peaches, loquats, and topped with exquisite cream. 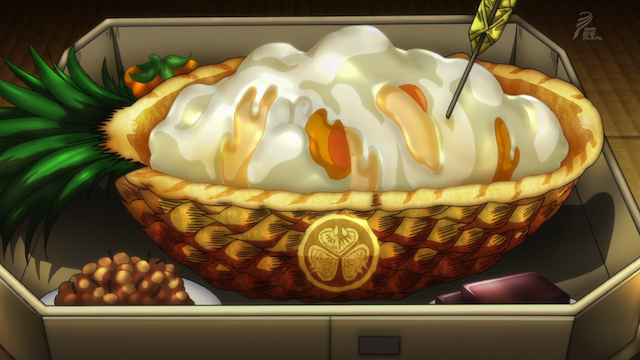 Ieyasu and his warriors are then treated to a banquet with a dazzling assortment of expensive dishes. They are offended because such luxury is against their idea of a warrior. 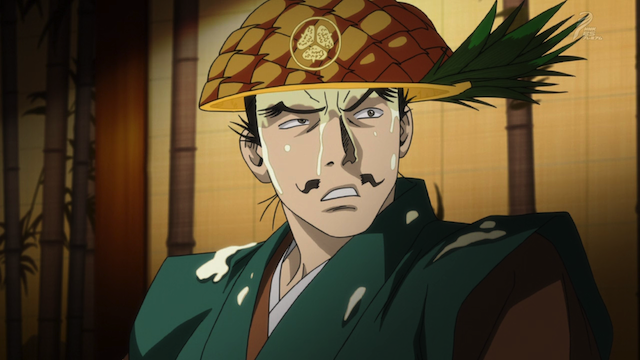 As one of Ieyasu’s men declares, “I taste naught but madness”. After choking down 5 courses of every kind of exotic dish, Sasuke enters the dining hall to serve them desert. Once again, he has a tremendous eye for detail, and has created what is, no doubt a delicious fruit salad, but he has failed to pierce deeply into the minds of those around him. 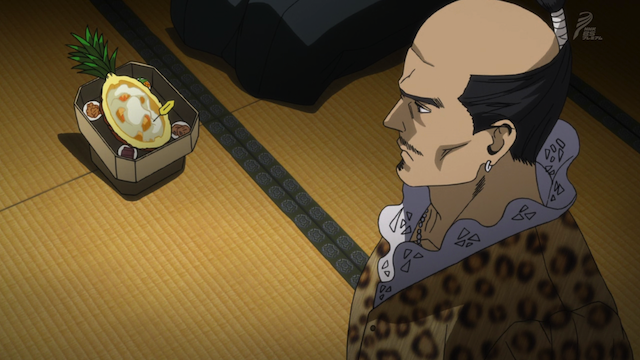 Ieyasu Tokugawa is enraged by the pineapple salad. Tokugawa's men demand that Sasuke commit seppuku to atone for the insult. Fortunately Lord Oda appears and defends Sasuke. He even says he would like to try some of the dessert he made. Once again, this show operates on the finer points. The subtleties of fruits, and tea kettles, and holes in socks are the immediate cause of actions of great importance in the world of Hyouge Mono. After the uproar in the banquet hall, Akechi and Sasuke are sent to assist Hideyoshi at Takamatsu Castle. Lord Oda, himself, intends to proceed to Kyoto, to the Honno Temple, where Senno has noted, he will be sparsely defended. Yes to both points. 😀 I am looking forward to seeing how this political tangle gets unravelled (and I want some pineapple). Your idea of putting both episodes together was very, very nice, as Episode 7 just wasn’t complete without Episode 8 tying up most of the events. I’m looking forward to the next Episode – the pre-ED scenes were definitely very ominous. P.S. You wrote ‘try some of the desert he made’ in the eighth caption. You don’t mind me pointing out some of these things, do you? Fixed. No, I don’t mind.